We are grateful to Sara for the national publicity generated by this article, the prize, and of course her hard work as project leader of the team at the Rowans that built the garden described in the article - from scratch. See next post for details of the latest developments at the Rowans. Food4Macc Project Leader Phil Shaw collects £250 work of gardening equipment donated by B&Q Macclesfield. (under the approving gaze of Alan Titchmarsh). 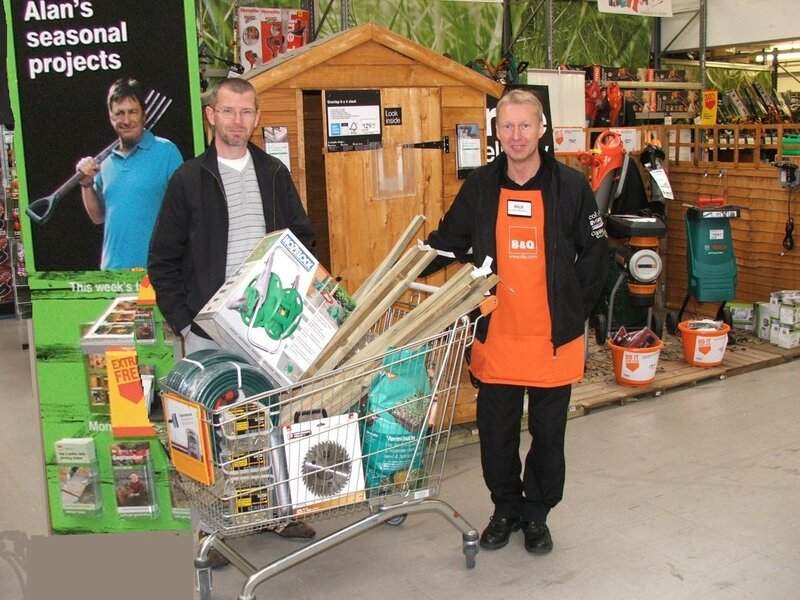 Our thanks go to B&Q and to Stuart and Judy for handling the grant application, with the support of B&Q's Natalie. 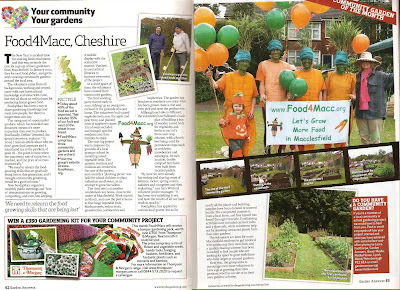 In the same week as our seventh Garden Share began, we had this coverage in the Macc Express. 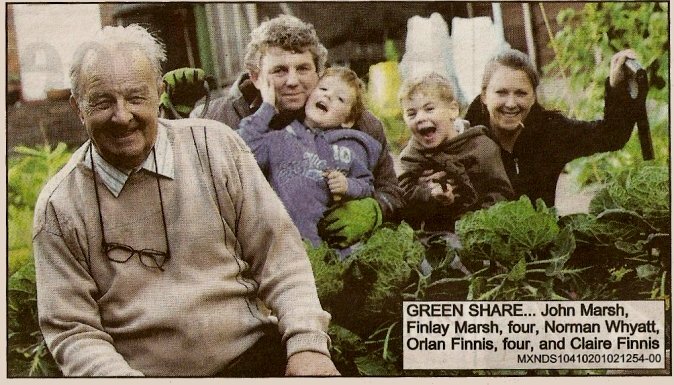 Congratulations to our Graden Share Co-ordinator Ruth Shercliff, and thanks to reporter Rhiannon McDowall for a very well worded article. Vegetables have thrived and friendships have blossomed thanks to the Food4Macc shared garden scheme. Norman Whyatt, 77, of Monsall Drive, Macclesfield, allows Claire Finnis and John Marsh to grow fruit and vegetables in his back garden in return for a share of the crop. But the great-grandfather of two, whose wife Madge died just over a year ago, said the duo's company is just as welcome as the veg. He said: "I think the scheme is absolutely fantastic, I would recommend it to anyone. "My wife died 13 months ago and it all got a bit much for me. It's nice for me because I come home and I have someone to chat to two or three times a week." "They have done such a good job on it, it looked great in the summer. "I came home from Buxton the other day and there was a turnip and some peas on my doorstep." Claire Finnis, 36, of Rodney Street, Macclesfield, works on the garden as often as possible with pal John, of Vincent Street. "I was on a waiting list for an allotment but last time I checked I was one of about 400, so this is perfect." Food4Macc was launched in March this year and is encouraging more food to be produced locally, reducing the community's oil dependency and carbon footprint.